Kati Kovács is a Hungarian female singer and actress. 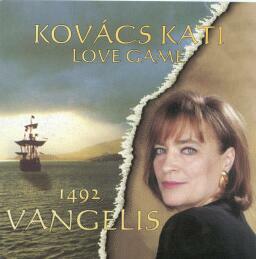 Besides singing, Kati Kovács also writes lyrics. First album: 1970 "Suttogva és kiabálva"
Hungarian cover version from "Conquest of Paradise"
hundred storms fight with us. and our people are dying. and good hope is so little. and our life is a suffering. why do we suffer for everything? for treasures, and for nothing. our life is worth only this much. why, why, and why? Why? nice new world, we're dreaming. fly, fly, fly, blue bird! Why would you leave us? You can't leave us! You didn't leave us, my Lord! where we can live and die. When man lives for man.